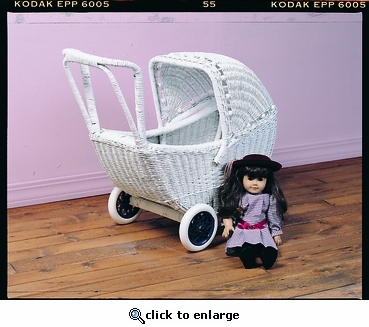 Just like the carriages they used at the turn of the century only smaller, this lovely beaded doll carriage is sure to have a place of honor in your little girl's room and heart. Made of hand woven wicker with an extremely durable frame. Its rubber wheels roll easily and are strong and sturdy. The sun hood rotates from front to back, just like the big carriages. White finish.